3D printed tower comparison between an 8” tower from a standard 3D printer and a 20” tower from one of our large format 3D printers. 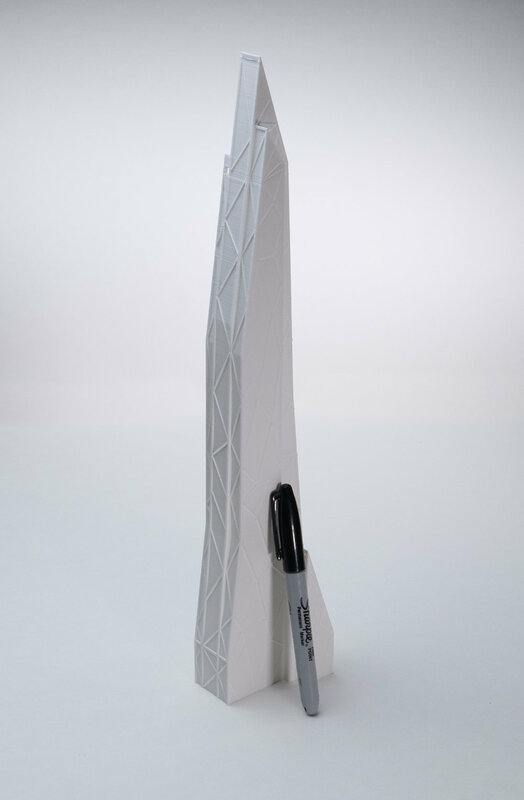 If you’re an architecture student wanting to 3D print your latest project, we can help. We’re a 3D printing service based in Austin, TX that focuses on providing large 3D prints at a low cost—if your design is 8” or larger, you won’t find a better price from any other 3D printing service. We also have a fast turnaround time, with most prints completed in 3-4 days (we also offer next-day printing for short deadlines!) And if you’re in the Austin area, you can come pick up your 3D print as soon as it’s ready. Interested? Contact us and we’ll get back to you today to talk about your project. You’ve probably discovered that most 3D printing services are very expensive for models more than a few inches large. We know that cost is a major consideration as a student, and we’ve optimized our business to focus on providing the best possible price for large prints. We also offer an educational discount for students, so make sure to tell us you’re working on a student project! A tower design that we printed for an architecture student. Don’t feel bad about procrastinating on your project. We were students once too, and we know how it is. Whether your design took longer than expected or your school’s 3D printer is booked solid with final projects, we can help you get your design printed quickly so you can show your best work. Our standard turnaround time is 4 days, but we’ll work with you if your deadline is sooner. In many cases, we’ve 3D printed building models the same day or next day to get things done in time for a project. And if you’re located in the Austin area, you can come pick up your print as soon as it’s done. We’ve printed a lot of architectural models. From student designs to display models of completed buildings, we have years of experience in 3D printing for these types of projects. One of our favorites was a group of 80+ building models for a 2018 exhibit at the A+D Architecture and Design Museum in Los Angeles. When you’ve worked hard on a design, you want the final display to represent your vision in the best way possible. We’ll apply our knowledge and experience in 3D printing building models to make sure your project looks its best. We focus on printing large designs, so you won’t be limited by the small 8” build volume that most 3D printers have. We can print single parts up to 20” and often create even larger models by splitting the design into multiple parts and combining them after printing. There’s nothing more frustrating than having to scale down your design to fit into the small maximum part size of most 3D printers (or to fit into your budget). We love printing architectural models at a massive size to show off the design and give it more of a visual impact. You’ll be surprised at how affordable such a large print is, too—our prices for 12”+ prints is lower than what many 3D printing services would charge you for a 4” print. Ready to start? Tell us about your project and we’ll get printing. Thanks for contacting us! We’ll get back to you very soon.